1 photograph; b & w; 6.5 x 4.25 in. 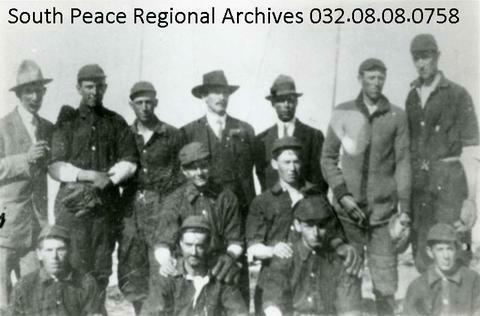 The Buffalo Lakes Baseball Team at the 1914 Lake Saskatoon Sports day. Standing: William Morris Robb, Wallace Edgar, Gaston K. Wagar, Walter McFarlane, Jack Carter, Oscar Anderson, and Roy Davis. Kneeling: Pete Louis and John Johnson. Sitting: Selmer Johnson, Billy McNeil, Norman Edgar, and Allan H. Parker.